and the food stories of his home in Phoenix, AZ. Born and raised in Kuala Lumpur, Malaysia, good food was a birthright and plentiful, with a wealth of delicious street food around every corner. That’s the food I grew up eating — a combination of Malay, Indian and Chinese food, which celebrates the diversity of the country and at the same time the uniqueness that each culture brings to the cuisine. Street food was approachable and a place for family and friends to congregate–it’s something I love about Malaysian food to this day. My grandmother was the one who introduced me to some of the most memorable dishes I have ever tasted — I had a simple upbringing, so it was never anything fancy, yet the flavours stuck with me in the best possible way. One of my favourites was her Pig Trotter Vinegar Soup. Not too long ago, I decided to make a film of her cooking this dish, as I realised I didn’t have any footage of her in the kitchen. When I saw how my relatives and family gravitated towards the film, how powerful they found the sound and sight of our grandmother in the kitchen, I saw that this opportunity wasn’t available for a lot of families. It was the decision to capture my grandmother’s story that inspired me to help preserve these memorable moments for others. What followed was the beginning of my video series Food Talkies, in which I aim to capture the personal stories of individuals and chefs. Growing up in Malaysia, filmmaking was not necessarily the ideal profession your teachers, family and friends would encourage you to pursue. There was quite a cultural resistance to someone dreaming about becoming a filmmaker. I left Malaysia when I was 19 to attend college in Arizona, studying Civil Engineering and going on to work in the profession for over 5 years. In the meantime, I kept learning about filmmaking on the side. Reading books, analysing films, watching tutorials, practicing with my own camera — slowly building my knowledge of the craft. I started making videos on the side, for free, to gain experience. At a certain point, I felt the projects were funnelling through enough, and I took the leap into freelancing full-time. I had made various projects, commercials and short films by that time, and after a few years, I looked at my portfolio and realised that there were a lot of projects related to food. I was always fascinated with food stories, so naturally, that was possibly why there were so many of them in my work. In Arizona, I relished the opportunity to tell the food stories of the locals. Being a young city, Arizona is filled with a lot of chefs that have forged the way for the next wave of food innovation. In Phoenix specifically, the food scene there has not been held to the highest esteem by many across the country — but I think this overgeneralising has caused many talented chefs to be overlooked due to bad press or media. It can be very unfair. I’ve had the pleasure of meeting and filming so many Arizona chefs who are innovating every day. 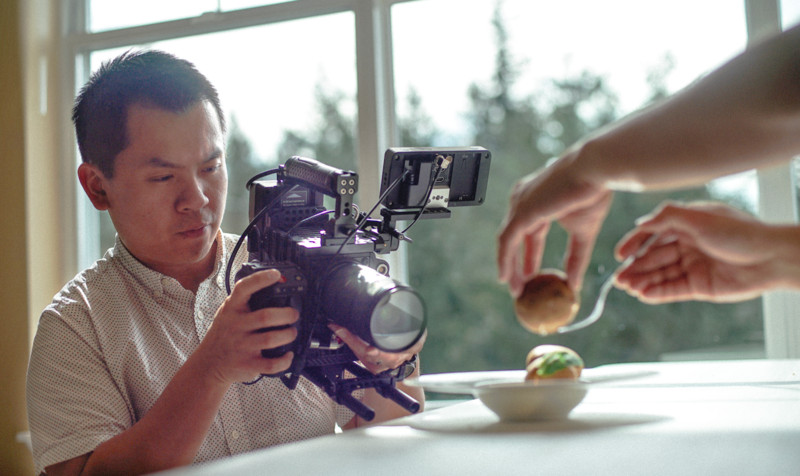 Making films on chefs like Kevin Binkley and Nobuo Fukuda, both based in Phoenix, have shown me their unwavering dedication and focus, no matter what’s thrown their way. In my opinion, Phoenix is on its way to great success in food innovation — and with all the personal food stories there, there should be no reason why it can’t be a great food city like New York City, San Francisco, and L.A. Earlier this year, my wife, son and I moved to Seattle — which is her hometown. Being so new to Seattle, I’ve yet to fully explore this great city — but the few people I’ve had the pleasure to film with thus far have really shown me that the stories transcend geographical locations. The stories in Phoenix are so precious and powerful, and the same power is found in the stories in Seattle. When I visit Malaysia now, I love that more has stayed the same than has changed. As someone who is based in the U.S., I savour coming home and catching up on flavours that are memorable to me. For people who live in Malaysia, they might feel differently. It’s hard to say if the food culture has evolved or stayed the same for them. I think Malaysia has drawn a great crowds to the popular places like Penang, Malacca, Kuala Lumpur. Like any tourist attraction, my advice is that people should venture a little further out. Each time I return, I see more and more to explore on the outer edges of these popular cities — food stalls and restaurants that have been open for over 40 years and still in business, serving amazing food. I recently traveled to Bentong in the state of Pahang, and this town had so much to offer — from the various fish markets and handcrafted tofu, to meeting a gentleman by chance and documenting his ginger farm the same day. There’s so much charm around the country — it just takes a little bit of exploring to find these unique sights. I think fine dining is still a stretch in Malaysia though. I’ve been exposed to a great deal of fine dining in the U.S. from filming with chefs, and I’d love to see Malaysian chefs bring a new level of cooking to the table. I’m sure there are many who are already paving the way and in due time, it will become tremendously successful back home. While I return home to Malaysia often, I can never get enough of visiting Japan — I’ve been 3 times now and each time I learn more and more about the cuisine there. The last time we were there, it was to film a documentary with Chef Nobuo Fukuda called Kakehashi, and we were privileged to have him take us to his favourite spots around where he grew up. One of the best memories I’ve had is in Machida, Japan — where I was able to witness ikejime, the Japanese process of humanely preparing a fish for consumption. Seeing this technique and the breakdown of a whole fish into beautiful slices of sashimi was quite eye opening. I’ll never forget how fresh and delicious that sashimi was! Fish is an ingredient that is particularly dear to me. When I’m in America, and thinking of home, I always come back to the same dish: steamed fish topped with ginger, scallions and soy sauce. That’s my idea of comfort food. We’ve had many steamed fish dishes growing up and it truly reminds me of family. A great part of me believes that we’re all destined to be drawn back to the food of our childhood. That we all have a flavour or a dish or a bite that was memorable to us growing up. With a lot of chefs, especially the ones we’ve filmed with for my series Food from Home, these food memories have left a lasting impression on them. But you don’t have to be a chef. I truly believe many individuals have that personal story, and there’s so many of these stories out there. I hope that people, in their own way, document these stories — even if they don’t revolve around food. I hope they capture these moments in their lives because these moments are what you don’t get back. I’m truly grateful that my grandmother was still around for me to capture her on film — I would be deeply saddened had she not been around when I realised I wanted to document her story. Stories around food are stories that remind us of eating together, as family and as friends. Since having our son and a daughter on the way, my wife and I are reminded of the importance of eating together — and there’s nothing like it. We want to instill these memories and moments with our children and hope that they in their own lives will treasure eating together like we did. I tell people’s food stories because my own food story through my grandmother was inspirational —and I hope that these stories will inspire others. From here, all I want is to continue to tell stories in the best possible way. I would love to explore more deeply the food from hundreds of years ago — I’m hoping to find recipes of that time, and bring them to life with the cooks and chefs of today. I think it’s a great way to honour the traditions of old, and remind the next generation of where our food came from. You can keep up to date with Andrew’s food stories on his Vimeo and Instagram. Andrew’s Elemental Tour of Phoenix is made with Alpaca — start sharing your own food adventures today. At my grandmother’s kitchen table: food stories from childhood and beyond was originally published in alpaca.travel on Medium, where people are continuing the conversation by highlighting and responding to this story.